Public speaking releases the jittery nerves built up inside of us as the undivided attention of a large audience rests in our voice and the message delivered. Those words will be heard by hundreds today and spread to thousands tomorrow, carrying a message that could have significant impact on one’s life and the future of your public speaking. So take advantage of these 6 ways to deliver an effective speech and be remembered not just as a good speaker, but as a great public speaker. 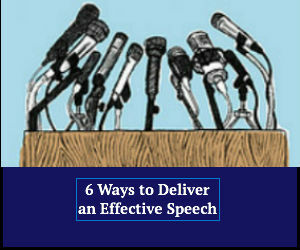 Words on your note card are only a fraction of how to deliver an effective speech. You don’t want your audience to be looking down at their cell phones throughout your speech do you? Then stop looking down at your notecards. Once you get on stage to speak it’s time to put away the safety cards and only use them when needed. If you’re constantly looking down at your notes that shows the audience you did not prepare enough for this speech, giving them the idea that you do not care enough about them to prepare a great speech. So give your audience the same amount of respect you expect by coming prepared and knowing what you’re speaking about by dropping the notecards. Offer a variety of visualization tools so your audience can retain as much information from your speech. While some individuals remember content solely from audio, other people remember better from visualization (PowerPoint, Keynote, White Board, etc.). By offering these visual tools you will be addressing the entire crowd while offering diversity in your speech. Delivery Tip #3 – Be Energetic! Gain, and keep, the attention of your audience throughout the entire speech by incorporating jokes, humor or funny slides. Adding humor that relates to your topic or making jokes about yourself will actually hold a longer attention span with your crowd. You can even ask your audience to answer these jokes, offering them a chance to participate and engage with the topic or humor. Remember to always keep an upbeat tone in your voice throughout the entire speech! These tips will help maintain the attention of your audience, especially if your speech is going to be long. Yes, your audience wants your information to be true and accurate, however they also don’t want a bunch of numbers to dominate the message (unless this is a mathematician conference, in that case, calculate away). Keep referencing your data, but keep it to a minimum. One other tip is to come up with one-liners on your own, so the audience can take away your own quotes and use or pass along to others. At the beginning of your speech inform your audience there will be a Q&A at the end. Suggest they write down two or three questions throughout the speech so they can receive answers they want today. When the time comes if no one is raising their hands, then start asking and answering your own questions pertaining to your speech or even randomness, this might calm the nerves of your audience also offering an “insiders scoop” on you. If no one is still wiling to raise their hand or shout out a question, inform the audience you will be back stage for the next 15 minutes for private questions or comments. Be comfortable with your voice and deliver a speech in your own words, as your audience is smart and they will be able to detect whether or not you’re speaking like yourself and telling real stories. So speak the truth and use your own words to express real emotions and find connections with your audience throughout your speech. Just be yourself and your audience will see the passion you have in the delivery of your speech. Use these 6 tips to deliver an effective speech and soon your name will be on the “must hear” list of well-known speakers.